Redshirt protesters rally in Bangkok on the fourth anniversary of the military coup that removed former Prime Minister Thaksin Shinawatra from power. BANGKOK – “I feel fear, we don’t know what is this!” Just arrived from Shenzhen, Zhao Fei and her two friends looked lost, wheeling their pink, silver and navy cases along the same intersection where four months ago to the day, the Thai Army launched a final assault on a mass anti-Government protest that occupied this luxury shopping district in Bangkok. “We were scared coming through the crowd in the traffic”, she said, admitting that her group did not realise that a political rally was scheduled for the centre of Bangkok, where they hope to stay until Wednesday – “to do some shopping” – before flying south to the beach resort city Phuket. 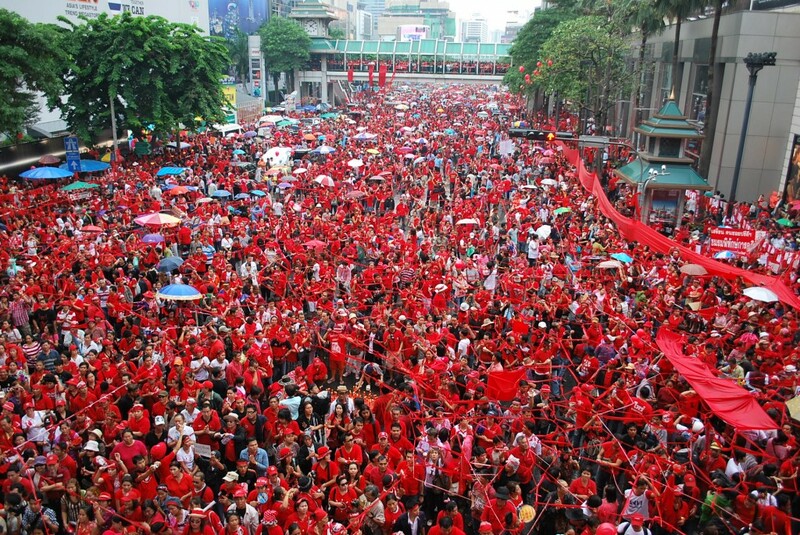 An estimated seven thousand redshirts were flying red balloons and weaving a street-wide web of red ribbon, the end of a day-long commemoration of the September 19 2006 army coup that deposed then Prime Minister Thaksin Shinawatra. For many, yesterday’s protest revived memories of the March-May rally, which degenerated into violence that left over 90 people dead and almost two thousand injured. Thailand’s important tourist sector, accounting for 6% of the country’s economy, was badly hit during the protests, with hotel occupancy in Bangkok less than 20% on average. Sunday’s demonstration saw traffic diverted from the Rajaprasong intersection, where some of the city’s largest shopping centres and high-end hotels are located, along with the famous Erawan Buddhist shrine. Despite the current State of Emergency in Bangkok, which outlaws public gatherings of more than five people, the police allowed the rally take place, while the Centre for the Resolution of Emergency Situations (CRES), the Government body set up during the mass protest earlier this year, ran a weekend “war room” to keep tabs on the redshirt protests taking place in Bangkok and Chiang Mai. Oy, a 51-year old housewife living in Bangkok, spent her afternoon carrying a placard listing redshirt grievances against the current Government. 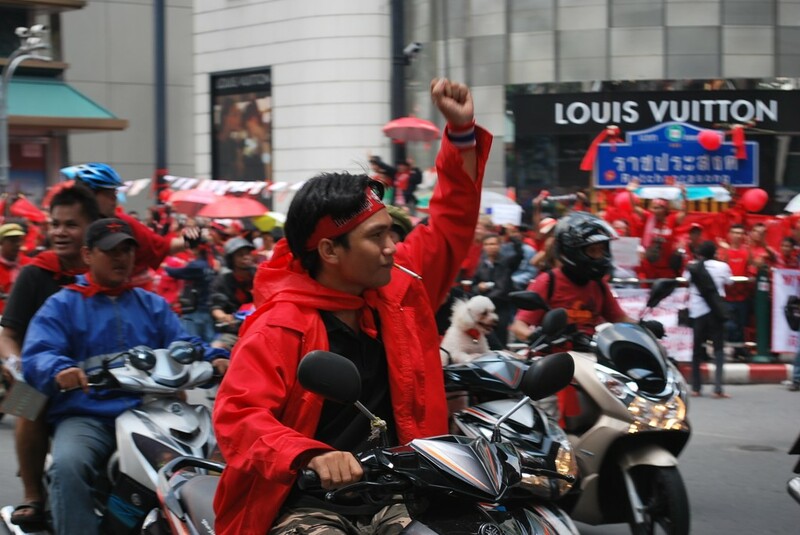 While the violence-strewn March-May mass protest was about ‘democracy’ according to redshirt leaders, this one-day event was more about ‘justice’, in the words of many redshirts I spoke to. “We feel we have to do something to remember the people who died, or there will be no hope”, she said. 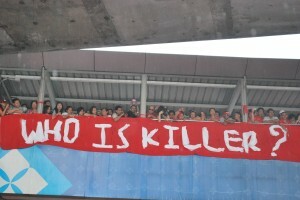 Her placard claimed, controversially, that 700 redshirts were killed during the protests. She added, “we are innocent, we are peaceful and we are not armed”. 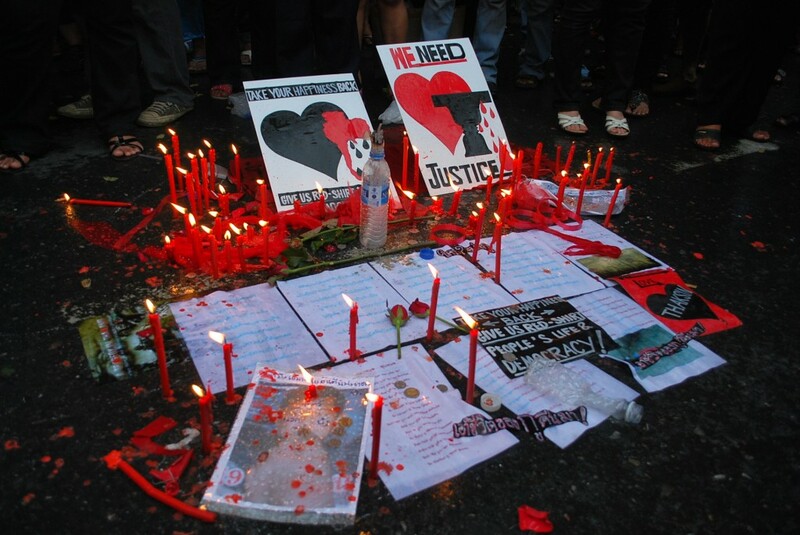 On April 10 last, still-unidentified ‘men in black’ were deemed responsible for the death of a former royal bodyguard, during the first military attempt to disperse the redshirt protest. On May 19, after redshirt leaders told the remaining protestors to leave, as the Thai Army advanced on the main rally stage, black-clad militants fought the army, firing grenades and seriously wounding a Canadian journalist. Listed as the 23rd wealthiest Thai in a recent Forbes survey, Thaksin is regarded as the funder-in-chief of the red movement. He has been on the run since fleeing Thailand – and corruption charges – in 2008, though last night ‘tweeted’ a message saying that he hoped for ‘reconciliation’ in Thailand, and adding that he is currently in Lebanon. parties finding themselves out of power after a 2008 anti-Thaksin ‘yellowshirt’ protest and ensuing coalition party defections resulting in the current Democrat Party, Abhisit Vejajjiva-led Government coming to power. While the change of Government was legal, redshirts believe that it was down to political and legal machinations. On Sunday morning, red shirt leader Jaran Dittapichai published a statement titled “4 Years After the Coup”, claiming that “the Courtiers disqualified two Prime Ministers and People Power Party” (set-up after Thaksin’s Thai Rak Thai/Thais Love Thai party was itself disbanded). “The Courtiers” is apparently a reference to the “elite groups” that redshirts see as the puppet-masters behind the various moves to oust their allies from Government. 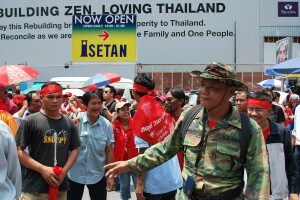 Yellowshirts and pro-Government allies regard Thaksin as the driving force behind the redshirts, and based their protests against the rule of his administrations and successor Governments on what they viewed his anti-royalist leanings. One of the lawmakers disqualified during those legal purges was Pongthep Thepkanchana, former Deputy Leader of Thai Rak Thai. I met him on walkabout at the redshirt rally yesterday, where he posed for photos and pressed the flesh. “He is a good man, a future Prime Minister”, insisted one of the ladies who beamed beside him, as friends and family snapped away. Peua Thai – the current incarnation of Thai Rak Thai – would be favoured to top the polls in any election, and will be heartened by the turnout in central Bangkok on Sunday. However all may not be well inside party ranks. A farcical recent leadership overhaul resulted in the outgoing party head Yongyuth Wichaidit resuming his leadership post after an apparent disagreement over a successor. Laughing-off the various glowing endorsements from redshirt supporters, Pongthep turned somber as the cameras stopped clicking. “Our democracy is damaged, and the coup of 2006 caused so much trouble for Thailand, which is not over yet”, he told me.